SPANISH IRREGULAR FUTURE TENSE VERBS. 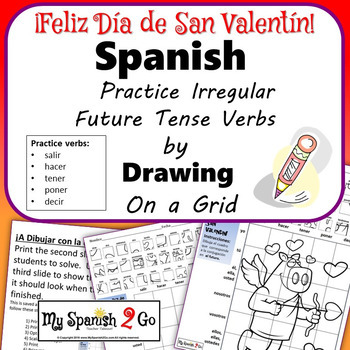 Students draw what they see in the little square reference practicing irregular future tense verbs to the grid to create a picture. Cute, fun, and great practice with conjugating! 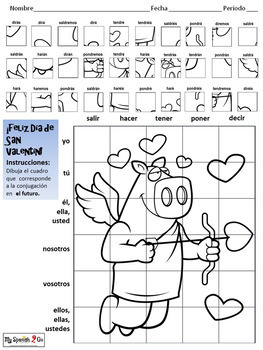 Valentine's Day Edition--students end up drawing a cute pig cupid! Have more fun by coloring it afterwards! 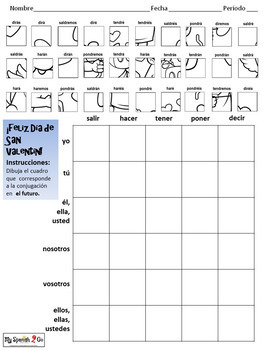 Practice these verbs: salir, hacer, tener, poner, and decir.